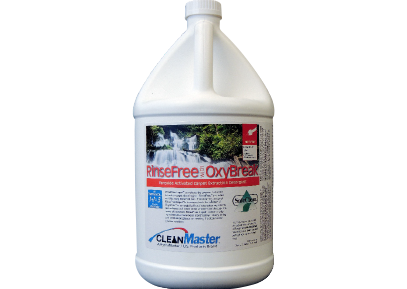 RinseFree with OxyBreak™ Carpet Extraction Detergent is an “In-Tank” extraction solution that enhances the longstanding commitment of the HydraMaster SafeClean designation. RinseFree Liquid contains only ingredients that have been identified by industry listing and certification groups as meeting the standard for greener solutions. Used in conjunction with Release Carpet Pre-spray, RinseFree Liquid completes the greener hot water extraction carpet cleaning job. RinseFree emulsifies and lifts away loosened soil. 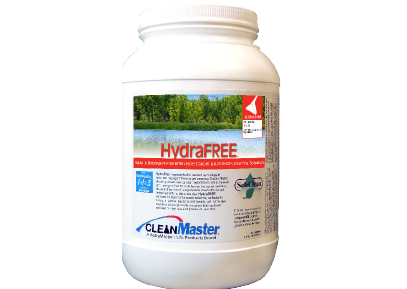 The free rinsing formula contains the HydraMaster exclusive ingredient Tritanol™, which helps the carpet stay cleaner longer and eliminates rapid re-soiling. It rinses freely from the carpet and leaves no tacky residue. The cleaning power of RinseFree Liquid is increased with the addition of OxyBreak™ to synergistically activate other ingredients and enhance soil break down and removal through the power of oxidation. . It does all this without the use of any intentionally added solvents, phosphates. or other additives which would disqualify its designation as a greener cleaning solution. RinseFree Liquid with OxyBreak™ is effective to use and meets the standards of cleaning and care for all synthetic carpet, including warranted stain resistant carpet. Its ultra-concentrated formula makes up to 356 gallons of extraction solution from just one gallon of concentrate.